packages to send to local troops serving in Kuwait. 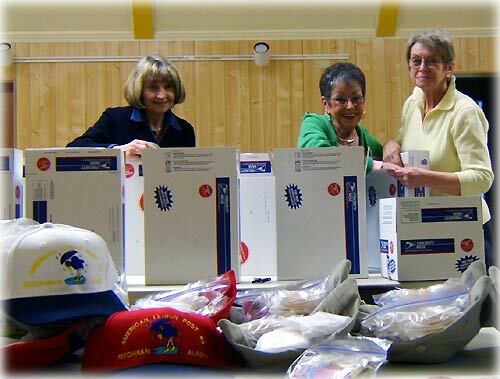 Pictured left to right: Kathy Ford, Susan Perry, and Linda Pratt. Not pictured was Diane Fergerson. Alaska: Juneau Access Construction Contract Terminated - Alaska Governor Sarah Palin on Thursday directed the Department of Transportation and Public Facilities to terminate the construction contract for the planned 11-mile pioneer road to begin the Lynn Canal Highway. The governor concluded that the one-lane pioneer road the contract would build is not what Alaskans need and thus is not in the best interest of the state. Alaska: 2006 Tax Refund For Alaska Telephone Customers - Acting Attorney General Craig Tillery advises all Alaska telephone customers of their eligibility to claim a telephone tax refund on their 2006 tax return. As a result of recent federal court decisions, the telephone tax refund is a one-time payment designed to refund previously collected excise taxes assessed on long-distance telephone usage. Ketchikan: Accounting to Gaming at the Internet Lounge By NANCY COGGINS - Jos Govaars owns the Crow's Nest Internet Lounge and operates it year-round for tourists and locals. In addition to the free monthly gaming events called Lan-Parties that appeal to the younger crowd, classes are taught including Accounting, Web Design, Microsoft Word, Excel, PowerPoint, and Photo retouching using Adobe Photoshop software. Govaars also rents out his large computer-filled room for birthday parties and other special events. As many as 16 guests can play games against each other. The Crow's Nest Internet Lounge has plenty of space for special events. National: Democrats confident of retaining Senate majority By MARGARET TALEV - Democrats said Thursday they expect to take control of the Senate next month as planned, after Sen. Tim Johnson of South Dakota survived emergency brain surgery hours earlier. The Capitol's physician, Adm. John Eisold, said an operation to drain blood from Johnson's brain had been successful and that he was "recovering without complication." Nevertheless, the 59-year-old Democrat remained in critical condition. National: Travel industry spreads news about passports By DAVID ARMSTRONG - New federal regulations compelling U.S. and foreign citizens entering this country by air to carry passports will take effect Jan. 23 - and many would-be travelers are not prepared, uncertain how to go about getting a passport and increasingly pressed for time. To help clear the air for airline passengers, the Travel Industry Association of America and Travel Business Roundtable have put up a how-to Web site. National: Realistic looking checks used by scam artists By THOMAS STAUFFER - There's no such thing as a free lunch, even during the season of giving. That's the first thought Delpha Andrusyk had after opening an envelope Monday that contained a check for $2,875 payable to her from USA Oil Refining LLC of Elkton, Md. "Truthfully, I thought it a scam right off the bat," said the 87-year-old Tucson, Ariz. resident. "But it actually does look like a real check." While USA Oil Refining is indeed a real company based in Elkton, Md., it's currently being used illegally by scammers apparently based in Ontario, said Chris Frye, an accountant with USA Oil Refining. National: Q-and-A on foods that make people sick By LEE BOWMAN - After a salad bar's worth of investigations into contamination of produce in several outbreaks this fall, officials still aren't sure they know exactly how spinach, tomatoes and maybe lettuce became targets of dangerous pathogens. Dave Kiffer: Statistically Speaking - I love statistics. When I was a little kid, I memorized reams and reams and reams of sports "stats". And even though I sometimes have trouble remembering my current telephone number (225- uhh, 08, uhh 70) and my various passwords and pin numbers, I can still spout Ty Cobb's lifetime batting average (.367), Wilt Chamberlain's 1961-62 scoring average (50.4) and the fact that Sandy Koufax struck out 382 batters in 1965. Now that I am older, natch, I have reached the point where weather stats are of great interest. Steve Brewer: Reassigning assembly duty - Grumpy dads everywhere dread the approach of the holidays. To us, the gift-giving season means one thing: "ready-to-assemble." Ann McFeatters: Judge's patience with FEMA at end - The judge's outrage comes hurtling through his words, demanding the government respond to his order that cutting off rental aid for thousands of Katrina victims just weeks after the deadly storm struck was unconstitutional, premature, incredible and "Kafkaesque." Clifford May: President Bush can still avoid defeat in Iraq - I was privileged to serve as one of the "expert" advisors to the Iraq Study Group (ISG), along with former ambassadors and CIA operatives, retired military officers and distinguished academics. It was a stimulating, edifying and - ultimately - disappointing experience. Deroy Murdock: Look for ISG report in fantasy section of bookstores - Among the many shortcomings in the widely panned Iraq Study Group (ISG) report is its blame-Israel-first mentality. If only the Jewish state would surrender more land to the Palestinians and hand Syria the now-occupied Golan Heights, grateful Iraqis would burst into song, defuse their Improvised Explosive Devices, and build a safe, free, and prosperous republic. The fact that so many of them are doing the opposite is - what else? - Israel's fault. Dale McFeatters: More than you want to know - The best book ever written about the United States came out Friday. It comes out every year - this is the 126th - and goes by the deceptively bland title "Statistical Abstract of the United States." Like the blurbs on a book jacket, the Census teases us with a few facts. We watch too much television (our judgment, not the government's) - 65 days' worth a year. In 2005, Internet users made 92 million purchases online and created 13 million blogs.